“Sweetest tomato ever” and “Like a party in your mouth.” More than one gardener sings the praises of Sungold Cherry Tomatoes, a hybrid golden orange cherry tomato variety. It is considered to be a cherry tomato classic because of its sweet and tangy flavor – “So sweet that even kids like it” says one gardener. 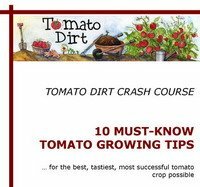 Add to that the fact that Sungold (sometimes written “Sun Gold”) produces abundant fruit until frost with very few vulnerabilities to disease and you may just want to try this tomato variety in your garden. Sungolds were developed by Japanese breeder Tokita Seed Company and introduced to American and British gardeners in 1992. Because the tomato seed business is very competitive, hybrid tomato parentage is carefully guarded. Having said that, speculation is strong that the Brandywine heirloom tomato among Sungold’s parents. Start from seeds 5-7 weeks before planting outside or purchase seedlings. In the garden, plant Sungolds in well-amended soil, about 36 inches apart. For container planting, choose pots at least 24 inches across and 12 or more inches deep. If you live in a warm area that enjoys a second season of tomatoes in the fall, they’re a good choice because they get to maturity quickly (about 57 days) and are so resilient. Give them what they need and Sungolds will reward you. They are heavy feeders, so be sure to keep them on a regular feeding schedule. And make room for them! It’s not unusual for Sungolds to grow to be 8 -10 high or more. For that reason, avoid planting them in windy areas. Stake them the tallest tomato cage you can find, even when growing them in pots. But even if you’ve got a busy summer and give them practically no care, Sungolds will keep producing until frost. 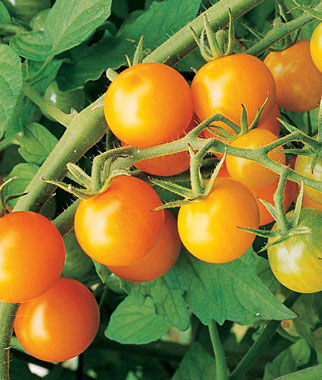 Sungold cherry tomatoes grow in clusters of 10-20 fruit. They’re ripe and ready to eat before reaching fullest golden orange color, but get sweeter as they ripen. Keep in mind that Sungolds never turn red, no matter how long they stay on the vine. They’re a good variety for young gardeners to grow. Kids like them, so they’re willing to pick them and taste them in the garden, which means they learn about ripeness and taste. Extra growing tip: towards the end of the season, Sungolds split more easily so pick them before or just at peak ripeness. Skins seem to crack less easily earlier in the season. Other notes: High in vitamin A. Tolerates heat well.